I love Ibena products! This throw is so cozy, and easy to clean. I have an Ibena throw that is going on 25 years old right now, and I still use it and love it. I highly recommend this brand! Stay nice and cozy with the Carrizo Lightweight Cotton and Wool Oversized Throw. This throw features a super soft cotton/wool blend construction with a beautiful Southwest inspired pattern, a lovely combination of vibrant colors in red, blue, grey and ivory to match your decor. The Blanket is jacquard woven and has a luxurious plush texture to provide warmth and comfort. Durable and machine washable. Dimensions 78.0 In. X 59.0 In. X 0.5 In. Love this throw .... machine washable .... comfy and cozy The best cotton and merino wool !!! So, I love blankets...I appreciate blankets of all sorts. My favorite styles however, feature southwestern designs and hues. The IBENA Carrizo Oversized Throw fits that bill perfectly. 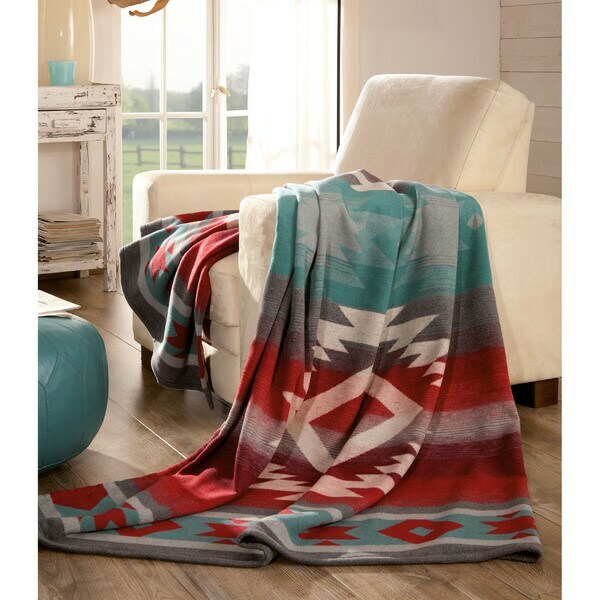 This blanket has a spectacular southwestern color scheme in addition to an impressive design. It is comfortably lightweight yet plush enough to be cozy and warm. This makes it an ideal blanket to have all year around. I enjoy it very much and would highly recommend it to others! Hi! My name is Dina and I’m a home owner. I love having blankets and throws readily available for use whether spring, summer, fall or winter. It’s important that my guests or my family have them at arms reach. I purchased this product toward the end of March. I live in the Pacific Northwest and I was looking for a blanket or throw for indoor and outdoor use. We tend to have chilly nights here and I wanted something warm but not heavy. I was pleasantly surprised when this beautiful blanket arrived. The colors are bright and cheerful. The pattern is not overwhelming. The wool and cotton blend lend to a soft and comfortable feel to the fabric. It’s surprisingly plush and lightweight in feel as well. It’s such a treat to wrap up with this throw on a chilly nite with my favorite tea. I appreciate the quality behind this product. I look forward to seeing other blankets from this manufacturer. Love this high quality cotton/merino wool blend throw made in Germany. The style is southwest, perfect for my décor. Place at the foot of your bed or throw over the arm of your favorite leather chair, you will have a beautiful and soft throw for those chilly days. a light 100% cotton and wool blanket, pure natural and very soft. I love love love this blanket. High quality fabric, thick and soft. Washes well, colors are perfect. I always look for quality and this wool throw definitely met my inspections. This throw is amazing! It’s beautiful. The colors are bright without being obnoxious. The weight of it is perfect. I live in Southern California where it can be cool at night. It’s perfect for snuggling on the couch or over a comforter if added warmth is needed. Love it! Love this throw- colors are gorgeous- am totally satisfied with this product. "can i throw this in the washer and dryer?" as per packaging --machine wash warm water / delicate cycle / tumble dry low heat / do not bleach / do not iron / washing will change texture but not performance - My advice use cool water etc and very low heat!! The fabric and design is what I was looking for. Looks very nice and hopefully warm according to the reviews.